We have personalised photo gifts to make occasions such as weddings, birthday anniversaries and graduations memorable. We do have good brilliant ideas that people in your life will love and cherish for many years to come. Memorable images can be turned into works of Art such as canvas prints and photo collages in colours that will match the decor, dads picture on an apron or iPad cover telling him how much you love him. At Snappie Studios, we aim to make every gift special and each occasion memorable which is why we offer a wide selection of personalised products that will put a smile on the face of your friends and loved ones. Our best sellers such as photo t-shirts, printed mugs and photo mouse mats are very popular with our customers but we also provide a bespoke service, so if you want a photo gift that is not on our list, come in store and speak to one of our photo advisors who will be able to help you get the photo gift you want. Snappie Studios also have a great range of home decor products uniquely personalised for you with your own images from weddings, birthdays and graduations to grace the walls in your home. Our home decor products include place mats, coasters, mugs, clocks, stretched canvases and collages to help you relieve your memories every time you walk into your kitchen, living room and bathroom alike. 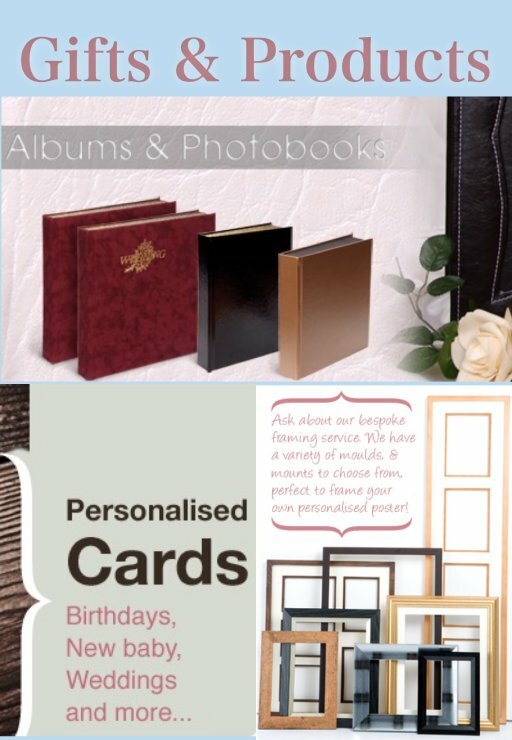 We also have in stock a wide selection of picture frames and photo albums in a variety of styles and finishes that are suitable for all tastes and wallets. We do have top of the range but cost effective ready to hang photo frames in an assortment of sizes to fit all prints. At Snappie Studio we will help you make the memorable events in your life special with our personalised products.